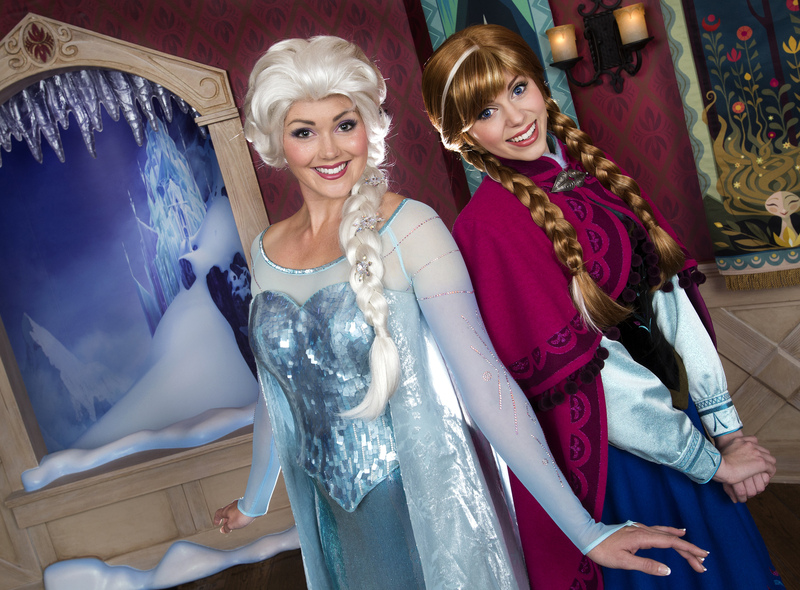 Frozen: Should You “Let It Go” or “Build a Snowman”? Image (C) Disney – Because I haven’t been willing to wait in line 2 hours to meet them yet. Without a doubt, Frozen is the most popular Disney animated movie right now, and Anna & Else two of their most popular characters. Whether you liked the movie or not, the box office doesn’t lie: as of this writing it has grossed $1.050 billion globally, making it the 12th highest grossing movie and the second highest grossing animated feature of all time! Now that Rapunzel has a new home in the Fantasy Faire portion of Fantasyland, Anna & Else have moved into her former meet-and-greet location, next to Pinocchio’s Daring Journey. Wait times to meet these two can easily top an hour and a half, even on slow days! Maybe even more popular than the characters themselves, though, is Elsa’s signature song, Let it Go. It won the Academy Award for Best Song, and you can’t turn around twice online without finding a cover of it, a parody of it, or some other rendition. He’s not wrong, but there’s more to it. The song is a stirring, inspiring, motivating anthem…that leads to destruction. The song starts with Elsa recognizing that what makes her different, her ice powers, has kept her isolated and now has driven her away from her kingdom. She remembers what her father told her, “Conceal, don’t feel,” and embraces that she’s past that–literally above it. She glories in her power and fully letting it out for the first time ever. “Let the storm rage on!” She’s no longer afraid, because limits no longer apply to her. Perhaps not, but it’s bothering a lot of other people. The kingdom of Arendelle is locked in a severe winter that’s destroying it. The people are suffering. The economy is crumbling. People are afraid. The very things she’s singing about, because they’re being taken to extremes and are entirely self-focused in her “kingdom of isolation,” are the things that are demolishing everyone else’s world. While Let it Go is a powerful and moving song, and for as popular as it is, it’s not the heart of the film. Left unchecked, the message in Elsa’s song is harmful in so many ways. In fact, while in terms of sound and style it’s most similar to Wicked’s Defying Gravity, lyrically it’s more similar to No Good Deed. The real heart, the song that celebrates all the things that are actually worth fully embracing: love, kindness, family, risk of rejection, other-centeredness, and even fun, is Olaf’s song, In Summer Anna’s song, Do You Want to Build a Snowman. Though not in song, she repeats this plea through her words and actions throughout much of the film. She risks her life to go to her sister, try to understand, and bring her home. She doesn’t want to change her. She doesn’t want to hurt her. She doesn’t want to “bring her down” (to borrow from another Idina Menzel song). She just wants to help her, love her, and be with her. It’s this love that ultimately makes the difference and saves the day. (To be as spoiler-free as possible if you haven’t yet seen the movie, I won’t say how.) And that love is first clearly shown in Do You Want to Build a Snowman. For as catchy and stirring as Let it Go is, if I’m going to emulate the sentiment and message of a song, and encourage others to do the same, it’s this one. That’s exactly what Anna did. And it’s what we need to do. Anna’s love for Elsa restored both Elsa and Arendelle. The eternal winter was broken. The isolation of “the Snow Queen” was ended. Peace and joy were restored to the kingdom. But it didn’t come from Elsa’s fear and isolation turned celebration of unrestrained freedom in Let it Go. It came from Anna’s dedication, love, and willingness to risk being hurt that was first demonstrated in Do You Want to Build a Snowman. Anna is a true hero to me. Kingdom Thinking: Which song from Frozen better describes you and how you relate to the world around you? Is it the song you want it to be? Both messages are equally important. Without Elsa’s freedom to be herself, she would never have been able to love herself, and consequently, been able to open herself up to love others. The first step was to let go of her fear of herself and what people thought of her. Releasing that fear allowed her to then take the next step and follow Anna’s example to not only not be afraid of others, but to love others.